“Boomshakalaka” has arrived on the iPad in the form of a tablet-sized version of the ’90s classic NBA Jam. NBA Jam for iPad will be familiar to anyone who ventured near an arcade in the 1990s (or if you downloaded the iPhone and iPod touch version of NBA Jam that hit the App Store earlier this year). You control a two-man team of NBA superstars as they take on a rival duo. It’s a standard game of basketball, except for the gravity-defying dunks, flaming basketballs, and excitable announcer. That would be Tim Kitzrow, who provided the games original voice-work and memorable catchphrases like “boomshakalaka”—he’s back in this iPad version to provide his trademark commentary. The latest version from EA Sports allows you to jump into a single game or play in “Classic Campaign” mode by letting you play as your favorite team taking on the other 29 NBA squads. You can also unlock legendary players such as Scottie Pippen, Dennis Rodman, Scott Skiles and Karl Malone. The iPad version also includes a local multiplayer option that allows you and a friend to get your respective dunk on over a Wi-Fi or Bluetooth connection. 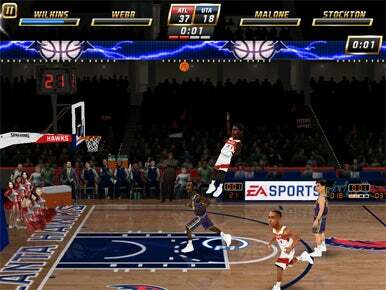 The iPhone version of NBA Jam also added this multiplayer functionality with an update Thursday. The iPad version of NBA Jam costs $10; you can download the iPhone version for $5.